It is now mandatory to link your Aadhaar card with your PAN card as per the Supreme Court judgement passed on 9th June 2017. The last date to link your Aadhaar number is 30th June 2017. Oh! Just one day left to get linked. Linking Aadhaar number with PAN card is made easy now. You can simply link it ONLINE or just sending SMS. Here is the exact procedure. 4. 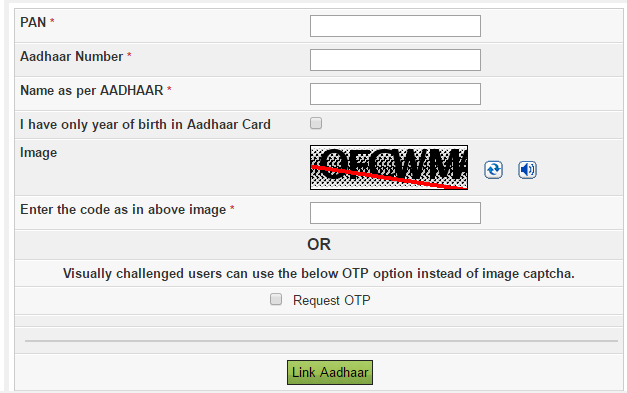 Enter your name as on the Aadhaar card. 5. Next you will see a line "I have only year of birth in Aadhaar card" . Here your have to select the box ticked if you have only year of birth. For example 1984 instead of date of birth 1-1-1984. Check your card twice to confirm it. 6. Now you have to enter code shown in the image. If you can also use OTP option instead of the code in the image. 7. Finally click on Link Aadhaar button. That's all.